Just finished watching it RAW and boy it was a good! So much was unraveled about EH, the director and chairman. JH now isn't so hard on EH as he found out his backstory kinda pities and sympathize with him. Now the last minutes of the drama were so good as we see that CSK wakes up from her veggie like state and says 'Unni' and I get the feeling now that the director is locked up, he is going to do something to chairmen!? The vibes he is giving off when speaking to CWK on the phone says something to me and I am also getting the sense of feeling that EH has played us all as well the WK and co that he was indeed RC all along with non threatening self and outward appearance Also, I was surprised at the reveal that Step mother is also a victim of abuse as well at the bruise on her wrist and that the GDG appeared at both women's side. Eun Ho confessed that he has been abused by both father and son Song for a long time. Claimed he has the CCTV for Director Song's crimes which lead Ji Hoon to Dir Song's house where he found the mask and shoes matching the description of the person who attacked Ji Hoon. I am not surprised to hear that. I have already suspected that both are abusers but did not have much evidence. But neither is RedCry. Eun Ho has to be in conection with Red Cry. He acussed the director but it was a set up. Oh, I can`t wait to watch the episodes this week. I am so glad that she did not die. Oh, I can`t wait to watch the episodes this week. Me, too! And I just realized that the finale is next week. I want to know how this ends but I will be sad to let go of WK and JH. No, we have 4 episodes left, this means that the last episode should air in two weeks. @bedifferent @gaby81 @bella1025 Thanks for the videos and the heads-up on what happened in ep 23-24. I got chills watching the video where the Girl In The Green Dress appeared next to BOTH stepmom and CSK.... I think we can safely deduct from this that both individuals are victims of abuse. Who could be abusing stepmom, though? Didn't CWK's father pass away? I thought she hadn't remarried and was living alone. Could she be abusing herself....? Thanks! I guess this must be due to the week that there was a "special" episode (which, of course, I missed since I couldn't find it subbed online). MyDramalist has January 10 as the date of the final episode, so that's why I thought it would end then. Hopefully that special won't count toward the total number of episodes. I was a little disappointed with CWK's behavior. She witnessed the beating and realized that LEH had been experiencing abuse for a long time. She even got the feeling that the head director might not be good at all, yet later she called LEH and asked him to comfort the head director. Even JH got aware that the head director has been abusing his son and LEH because both got scared of him. LEH's fear was even expressed: the head director will get mad, when he discovers what his son has done. Her conversation with LEH bothered me because she didn't try to help LEH like she did for Ha Na or Bit Na. she should have felt concerned when he declared that he survived!! Sure, the next episode shows that she wants LEH to keep a distance from the head director Song. She lived abroad for ten years (2006-2016) and right after her return, SK had her accident. To conclude, CWK's interest was more focused on her stepmother and less on her sister. It looks like her life would evolve around her mother. And the question is: why? I guess, it must be related to the abuse which is buried deep down. Surprising is that we are now shown a bruise on HJO's ("the stepmother") wrist and she even adds that she often hurts herself. How did she get these bruises? Then the girl with the green dress appears indicating that HJO might be in an abusive relationship. But we never saw HJO with a man or someone else. However, we shouldn't forget that in the second episode HJO arrived late to pick up ES so that LEH took care of her. So this could be related. Another explanation is that HJO got beaten because she had abused CWK mentally before... saying that she would side with her ex-husband aso. Red Cry could have become aware of that. This is another possible explanation. Finally, I would like to comment about LEH's fate. 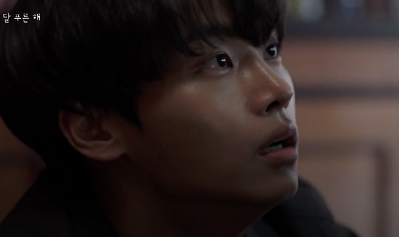 My heart ached for that poor boy, especially when you see his face expressing his immense fear of head director Song. I really got mad at the director Song Ho Min, when he described LEH as lucky. SHM knows pretty well that LEH has been abused by his own father, just like him. Moreover, SHM did the same to him. What we have all been suspecting about the head director Song has been implied in the last scene. We heard from LEH that he hates desk and indirectly poetry. So this room is where the abuse happens. But what kind of abuse? To me, Song has been abusing LEH sexually. Notice that Song is asking for comfort. But what kind of comfort? Is it reading poetry? I don't think so because LEH is already looking for books, when Song makes his demand. Secondly, in his request he adds "for the first time in a long time" which indicates that LEH hasn't done that for a long time. Yet, we saw that Song has been abusing him mentally and physically with his rifle even before this request. As conclusion, this can not be physical and mental abuse. Moreover, the choice of the poem with the verse "a child is eaten". The episode reveals that LEH has been in contact with Red Cry because of the conversation with CWK. He said that someone said the exact thing like CWK did: "If you think that way, you'll continue to live that way. Because you think that way, you'll end up living like that forever. It doesn't matter if you think they're your family. They don't agree with you. They will just use you and lure you. You're just brainwashed. " I believe, Red Cry wanted to take revenge for LEH but the latter refused. On the other hand, LEH might have helped Red Cry by giving him information. I really enjoyed the conversations between JH and LEH... It was pleasant to see how JH tried to act like a hyung giving him some advice, praising LEH and even proposing him to find a job for him. Concerning Red Cry, I have the impression that he is involved by incriminating Song Ho Min. First, the police will stop looking any further and he can keep his "judgement". Secondly, I also think that Red Cry uses this in order to punish the director who abused LEH for a long time. Uhhhh i just started the episode but WHAAAAAT?!?!?!?!?!? @bebebisous33 i'm literally 5 mins in but i read the start of your post and i need to get to that part myself but perhaps CWK is just that indebted to authority figures but she doesn't realize it..
powerful episode. i think it's deeper than just LEH being red cry and i hope so too because it wouldn't give him a chance to live in the world and be without trauma either. i can't wait until more secrets unravel tomorrow then we have about 3 more weeks....this show has bee extraordinarily written. this suspect pool is going around circles. When you think your 100 prosent sure they through you another clue. after watching todays episode i'm sure eunho is somehow part of the red cry. The head director is an awful man. Hope he has some kind of punishment. I think the director was framed to be to red cry. Eun Ho is Red Cry, I think. It was almost obvious when he read the Leper to the head director. In one of the previous episodes it was mentioned that possibly Red Cry hates poems... as someone supposed here maybe Eun Ho was abused by the head director in that room. And the next episode Eun Ho will say the folliwing: "Now I think I can finally do what I really wanted to." I think this means he wants to stop. That is why Song director was framed as Red Cry. Because actually Red Cry want to stop. The scenes with Eun Ho and the director and Head Director were so sad and chilling. If Eun Ho isn't Red Cry than he's connected to Red Cry. Not going to lie, I think Eun Ho being Red Cry makes the most sense, and for me, might be the most compelling outcome. It's not really surprising if he really turns out to be Red Cry. In japanese dramas/anime/mangas Eunho's type of character tends to be a twisted/psycho villain/killer b'coz of what they experience during their childhood ot they're twisted from the start. I haven't finished watching today's episodes but after seeing LEH being beaten by the director, I really think that he cannot be Red Cry. His response to the beating was to submit. His response to WK's questions was to use kind words for the director. He said that he and the two directors were like a "normal family." Only a person who is enduring that sort of abuse will have those reactions. Only someone who has no idea what a real family is like would think this is normal. Although I'm enjoying this show, I am finding watching it very painful and I wonder about the writer's life experience. No one could write this story unless they knew some of these things first-hand. Only a person who has endured abuse like LEH will know that the only way to "win" against the abuser is to surrender and survive just even one moment longer than the person who is hurting him. This reaction to being harmed is Not something someone from a happy family could imagine. A person like LEH would be very unlikely to want to cause harm because he has known deep pain at the hands of others. oh yeah!!! just finished downloading finally i can watch the episode. If Eun Ho was not Red Cry then what would be the sense of this last scene, when he read that very poem which was qouted in the first episode? I can't wait to watch it. I am so curious! Also I read some very interesting assumptions about the identity of the green dressed girl here. It was a kind of strange that she appeared next to the stepmother then next to Se Kyung. What is the meaning of it? What if there was a third child and she is that girl? As we already know she was abused too. And what if this little girl is Soo Young? It is not too possible but I remember that Nam Gyu Ri said that her character is a mysterious one. (Hak Yeon said the same about his role...). What is her mistery/secret? Based on the latest ep, EH definitely plays a much larger role in the RC community than I originally thought. I do feel a lot for him though. If that abuse is all he has ever known growing up, it must be difficult for him to get out the director's and his father's clutches. Someone also pointed out the words of the director's father whereby he wanted EH to comfort him in a long while. I, too, took that to mean sexually. At this point, I still believe that RC is the psychiatrist/therapist. I do wonder how he came to know about EH. Great episode. N/Eun Ho... one moment I want to hug him, the next, I fear for him losing whatever humanity he has to the injustice he is forced to endure. @cyan5tarlight @thistle @partyon Eun Ho is shaping up to be one tragic character... I hope the writer is brave enough to go darker with Eun Ho and his Red Cry association. Cuz at this point, the question is whether he is RC leader or a member. In either case, his life is miserable but at this point, he still has the choice to walk away, to disengage, to stop. Ji Hoon offered it to him, CWK said the same the next episode. @bebebisous33 I understand your disappointment about CWK not actively remove Eun Ho from the head director or report her suspicions (very unlike of her character). I think the writing is purposeful so that it will have to be up to the individual, Eun Ho to break the violent destructive force that is changing him. It’s such a sad sad case. Wonderful drama. Sorry to cut your post, but I think CWK falls victim to one thing. Unlike JH and the audience, she didn't witness every single interactions and confession from LEH and the director. She didn't see the director break down in fear. She didn't hear LEH's confession on how he always have to clean up after JH and that he's scared that the head director would find out. CWK suspected the head director for doing something horrible, but she's not certain because so much clue is hidden from her. We, as the viewers, were privileged to those knowledge, and JH, after listening to what CWK and watching Director Song's behavior, had managed to put two and two. But before then, he didn't understand LEH's dilemma because he was too busy looking things through his lens. As for LEH...I'm curious what he meant when he thanked CWK and claimed that because of her, he survived. Did he thank her because she told him what Director Song said (to admit to everything) so that LEH would make the decision to confess to Director Song's involvement? Because I think CWK intentionally told LEH everything Director Song said so LEH would break the belief he had on Director Song, that he's a good guy, but he's just weak. She wanted LEH to realize Director Song isn't the "good guy" he thinks, and that he's willing to let LEH take his fall, hence LEH's tears of disappointment. Or did LEH thank CWK because she did everything he expected and had her helped him escape being pinned as Red Cry? He survived because she helped him escape detection. Just wondering.